China Rich Girlfriend // The sequel to Kwan’s Crazy Rich Asians cannot come out soon enough. Picking up with the characters from first book, the story continues on mainland China, with more $ and more problems. Dead Wake // Erik Larson’s latest work transports the reader to 1915 and tells the story of the last crossing of the Lusitania. This book arrived in the mail today and I am embarrassingly excited to read it! We The Animals // Justin Torres reinvents the coming-of-age story, as seen through three brothers, in a way that is sly and punch-in-the-stomach powerful. The Summer We Read Gatsby // Two half-sisters summer in the Hampton’s and must decide the fate of their aunt’s home that they inherited. The perfect warm weather read. Cutting Teeth // A group of thirty-something couples gather at a beach house on Long Island, children in tow, as Fierro captures the complex dilemmas of early mid-life. The Empathy Exams // A collection of essays asking essential questions about our basic understanding of others: How should we care about each other? How can we feel another’s pain, especially when pain can be assumed, distorted, or performed? Is empathy a tool by which to test or even grade each other? 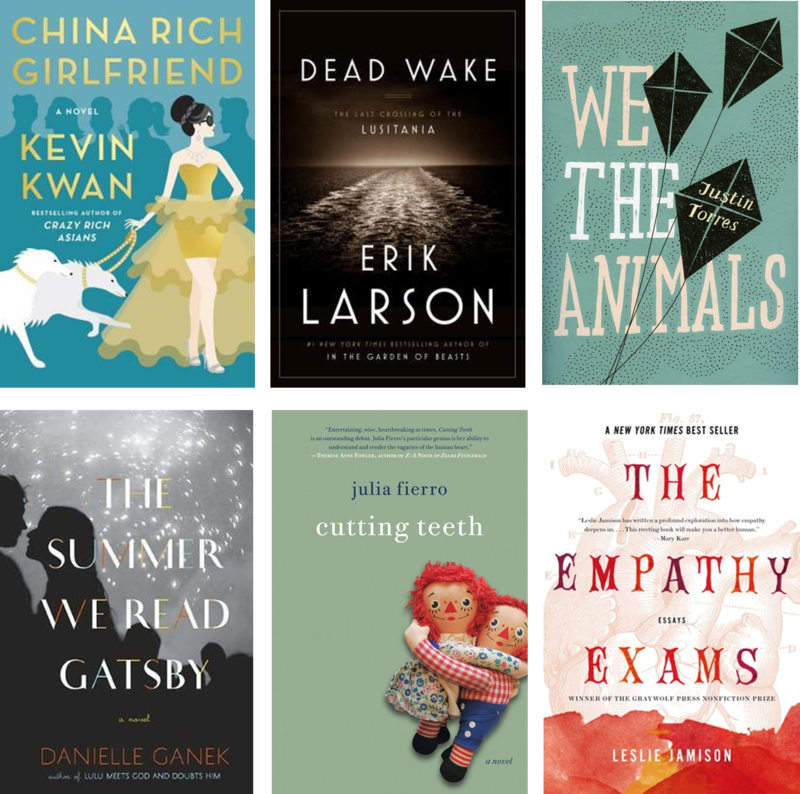 This entry was posted in books and tagged book list, books, China Rich Girlfriend, Cutting Teeth, Dead Wake, reading, The Empathy Exams, The Summer We Read Gatsby, We The Animals. Bookmark the permalink.